The surge in the 10-year U.S. Treasury yield Monday to the psychologically important 3 percent level was accompanied by a slide in the S&P 500 Index. But poor earnings, especially from the bellwether industrial blue chip Caterpillar Inc., may raise worries about economic growth, undermining investors’ risk appetite and hitting stocks and bonds alike. It doesn’t help that U.S. equities are in a danger zone, with sky-high earnings expectations. So what triggered Monday’s sell-off? Take a look at the performance of telecoms and utilities. 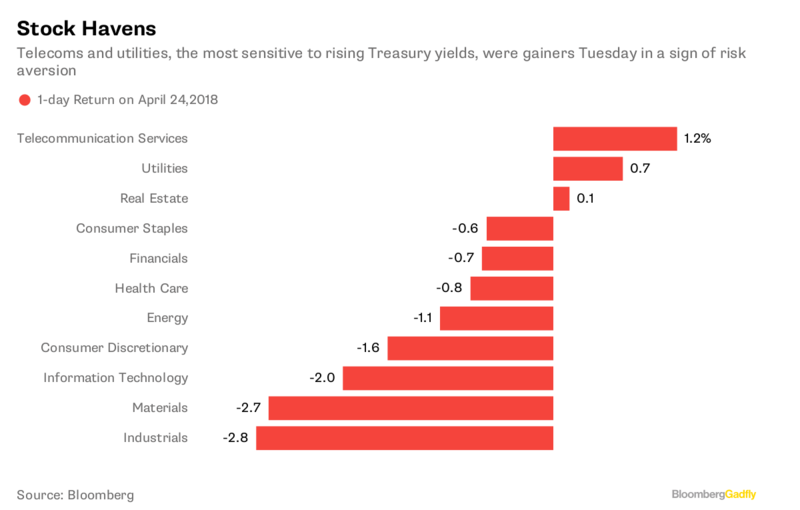 If investors were really worried about rising interest rates, wouldn’t these yield-sensitive sectors be hit hardest? On the other hand, when risk aversion prevails in equities, those industries are sought as havens. That raises the question of how much momentum, or economic fundamentals, are behind the rising 10-year yield. “Bond king” Jeffrey Gundlach, for one, says the odds of the 10-year yield holding above 3 percent are very low. China bulls are watching, because the stars are aligned for President Xi Jinping’s dream of ascendancy, with a possible repeat of the 2013 taper tantrum the only storm on the horizon. There’s little current evidence of that concern. This year, mutual funds and ETFs bought a net $18.5 billion of offshore-listed Chinese stocks, and another $11.6 billion onshore through the connect pipelines with Hong Kong. The U.S., on the other hand, saw an outflow of almost $16 billion. reserve ratios last week after disappointing first-quarter GDP expansion, and dropped the word “deleveraging” – code for slower growth – in a policy statement this week. The dual-class shares that Hong Kong will permit from next week may herald a flood of IPOs, another catalyst for the Hang Seng Index. Goldman Sachs Group Inc. expects companies to raise $38 billion there this year, well above the 10-year average of $25 billion. The U.S., meanwhile, hasn’t had an IPO boom since 2015. Uber Technolgies Inc. is delaying its listing to 2019, possibly (and embarrassingly) after its Chinese clone Xiaoju Kuaizhi Inc., better known as Didi Chuxing, goes public, the Wall Street Journal reported Tuesday. Hot IPOs? 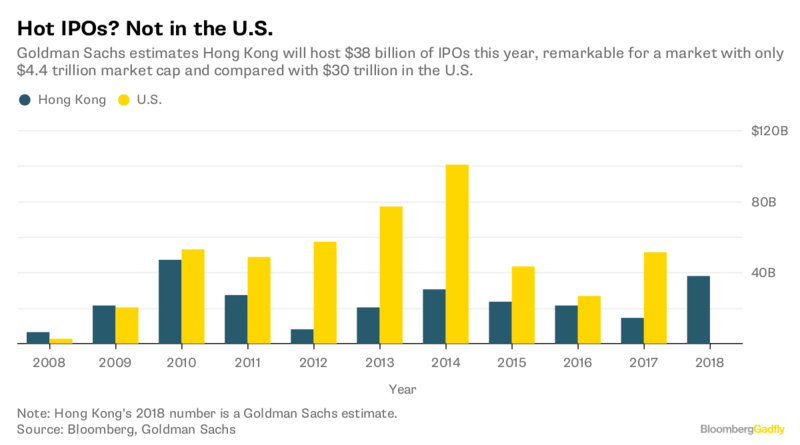 Not in the U.S.
Goldman Sachs estimates Hong Kong will host $38 billion of IPOs this year, remarkable for a market with only $4.4 trillion market cap and compared with $30 trillion in the U.S.
And in little more than a month, China’s A shares will be included in MSCI indexes. As a result, passive funds alone will buy a net $7.8 billion, Bernstein Research estimates. Mind you, China’s ambitions go far beyond a mere 5 percent weighting in the MSCI Emerging Markets Index. From May, daily northbound trading quotas for the Shenzhen and Shanghai pipes will quadruple, a move that may eventually raise A shares’ MSCI presence to 15 percent. The 10-year yield is now approaching the level seen in the taper tantrum, while the Hang Seng and CSI 300 indexes are hovering around the year-to-date breakeven point. They have pared gains, certainly, but there’s little sign of worry. Other stars are lighting the way.